Minidumper HS701: the high-tip dumper goes “extra”! The tracked minidumper is a vehicle used for construction work and remodelling and laying out gardens. It can move over uneven, muddy and sandy ground and even on slopes where wheeled vehicles cannot guarantee a suitable grip. The unique high-tip system by means of vertical guides, implemented on this type of machine, is patented by Hinowa. It allows a single operator to independently unload material directly into containers or low-sided trucks. Now, the high-tip mechanism of the HS701 minidumper has become “extra”, guaranteeing an even greater tipping height for unloading over the sides of standard trucks. The HS701 model in the current Hinowa minidumper range, which handles loads from 400 to 2,500 kg, is currently available in the well-known and popular “construction”, “self-loading” and “high-tip construction” versions. The range is now expanded with the new “extra high-tip construction”, “extra high tip and self-loading” models. The machines are all multi-purpose, heavy-duty, compact and quick to unload. These added values, which demonstrate Hinowa’s commitment to investment in technological innovation, are aimed at producing increasingly advanced models with improved performance which respect the environment and safety of the operators. The HS701 “extra high-tip” tracked minidumperis available with a construction and self-loading bucket. The latter has a hydraulic oil heat exchanger which prevents it from overheating, so it can tackle long and intense work cycles at a constant temperature. This results in increased strength and efficiency. Both versions are extremely compact and have a high load capacity which makes them both practical and reliable in any work situation. They come in a petrol or diesel engine version. The version with the construction bucket can be fitted with a Honda GX270 single cylinder 270-cc engine and 6.3 kW (8.4 HP) at 3,600 rpm or a Kubota OC95 single cylinder 416-cc diesel engine and 7 kW (89.4 HP) at 3,600 rpm. The Kubota OC95 engine can also be fitted on the self-loading bucket version. A Honda GX390 single cylinder 389-cc engine and 8.7 kW (11.7 HP) a 3,600 rpm can also be used, travelling at 4 km/h. Both versions have a mechanical distributor and three hydraulic gear pumps. The Hinowa HS701 minidumper range has always focused on high performance and safety. The compact design showcased by these two “extra high-tip” tracked models makes them suitable for working in limited spaces where they can be easily manoeuvred through narrow entrances, such as gates and doors. A distinguishing aspect of these two new versions, which is featured in the entire range, is the excellent weight distribution. The tracked undercarriage has three rollers on each side which means that the HS701 minidumper can be easily moved on different types of ground and on slopes with a maximum 15° incline (with the bucket lowered). The rubber tracks, 180 mm in width and tensioned by a lubricated cylinder system, place less pressure on the ground, decreasing the load at the base and causing less damage to the surface even at the most critical times. Hinowa has also confirmed the hydraulic track widening system in these models which allows the track to be increased from 758 mm to 1,058 mm. This solution increases stability in the most critical conditions and improves grip on any type of terrain. HS710 “extra high-tip” minidumpers weigh an impressive 746 kg minus the operator (construction bucket) and 852 Kg (self-loading bucket) with a maximum load volume respectively of 0.29 m3 and 0.25 m3. 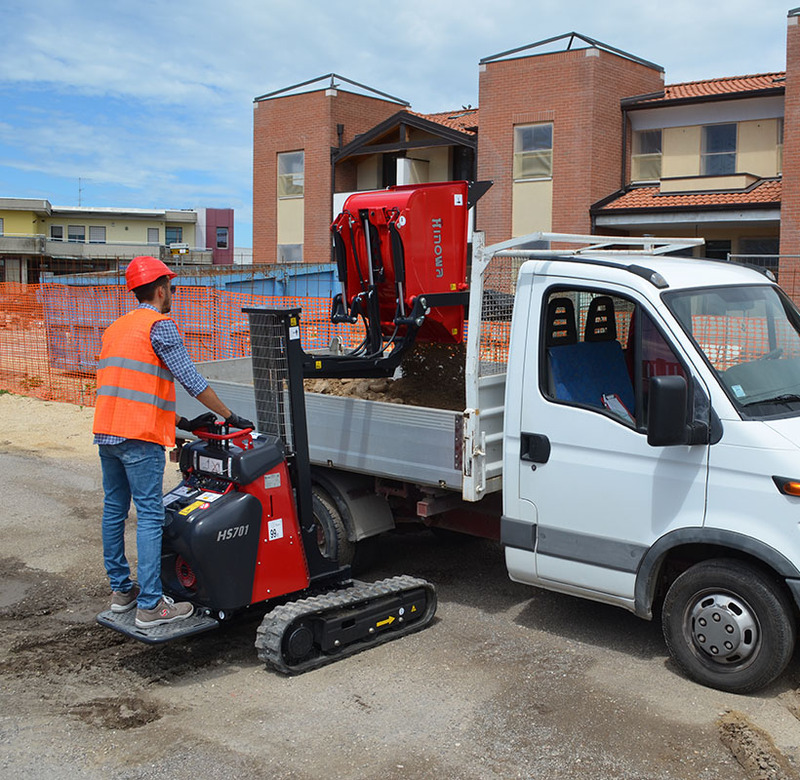 They can shift up to 550/360 kg for easy handling and transportation of any kind of material and/or rubble. Thanks to the hydraulic transmission with practical easy-to-use controls, the Hinowa HS701 tracked minidumper offers unparalleled manoeuvrability and comfort. To make life even easier, the operator can choose the speed based on the type of terrain: slower on uneven ground and faster on the flat. Hinowa has taken care of even the minutest details, studying the overall design of its minidumpers to offer maximum ease-of-use combined with the best possible performance. Thus, the machines are equipped with a foldable platform, for example. When it is extended, the operator can stand on it to easily get on and off the vehicle; when the platform is folded up the total length of the minidumper is decreased saving space for transport or storage. To optimise your work performance, the minidumper has a control panel, which is easy and intuitive to use, in front of the operator, so all the control levers are easily accessible with a handle to guarantee a solid grip while driving.